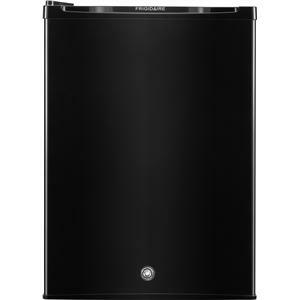 The Compact Refrigerator ENERGY STAR® 4.5 Cu. Ft. 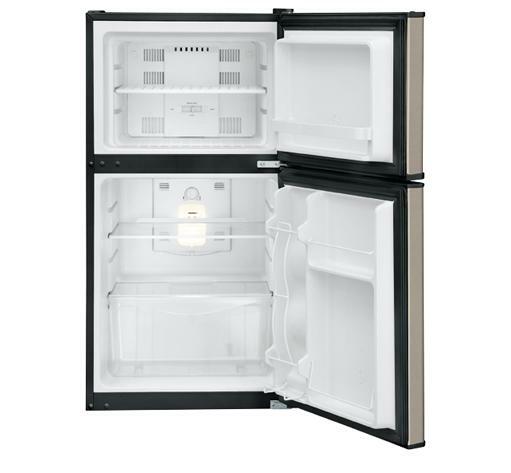 Compact Refrigerator with One-Wire Freezer Shelf by Frigidaire at VanDrie Home Furnishings in the Cadillac, Traverse City, Big Rapids, Houghton Lake and Northern Michigan area. Product availability may vary. Contact us for the most current availability on this product. Capacity: Refrigerator 3.1 Cu. Ft.
Capacity: Freezer 1.4 Cu. Ft.
Capacity: Total 4.5 Cu. Ft. Depth with Door at 90° 43"
These small, environmentally friendly compact refrigerators keep your food fresh and your beverages frosty while helping to reduce greenhouse gases. You'll also save money on your monthly utility bill and keep some cash in your wallet. These refrigerators are great for a home bar, office space, dorm room, or any limited space. have options for your home and any living space! The Compact Refrigerator collection is a great option if you are looking for Appliances in the Cadillac, Traverse City, Big Rapids, Houghton Lake and Northern Michigan area. Browse other items in the Compact Refrigerator collection from VanDrie Home Furnishings in the Cadillac, Traverse City, Big Rapids, Houghton Lake and Northern Michigan area.